Love and Butter: Don't Throw Out That Pumpkin! "Rich in potassium, a nutrient that helps maintain blood pressure and kidney function, pumpkin has a high fiber content, which has been linked to a lower risk of heart disease. Pumpkin flesh also contains a fair share of vitamin C, an antioxidant essential for healthy skin and gums.The gourd's high levels of carotenoids account for its orange color -- and star status. 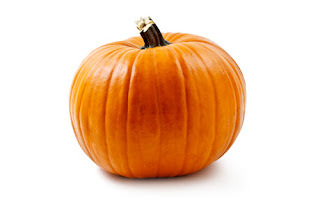 In addition to its vision-promoting beta-carotene, pumpkin contains the carotenoids lutein and zeaxanthin, which researchers now believe help protect against macular degeneration. Alpha-carotene, yet another invaluable pumpkin offering, may even aid in the prevention of tumor growth. Pumpkin seeds (or pepitas) also provide many nutrients, including bone-strengthening magnesium and copper. On top of that, the seeds contain cholesterol-lowering phytosterols and omega-3 fatty acids, which help reduce inflammation and may help prevent heart disease." Seed and cut a large pumpkin. Pile it into the largest pan you have. Add some water to the bottom and put in a 350 degree oven for 1-2 hours based on size. Scoop it out and discard the skin. Run it through the food processor until smooth. Then bag it up for the freezer. 2 cups will substitute for 1 can of pumpkin in any recipe. When you need it just defrost and use. Or cook it straight from frozen. The 2 cup portions are thin enough to break into pieces even when frozen solid. Just slam them on the counter edge. You could try this super yummy pasta sauce. Or fight off winter germs with a smoothie! I also slip it into chili, cheese sauces, soup or bread...and there's always good ol' Pumpkin Pie!